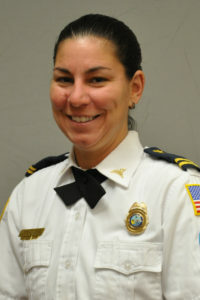 Kasey Ras is an Assistant Operations Supervisor/Paramedic and started her career with Sunstar in November of 2010. When Kasey was asked what led her to EMS, she responded that, when working as a sales representative, she had witnessed a very bad accident. Kasey felt helpless and had no idea what to do but knew she never wanted to have that feeling again. Kasey quit her job in sales, started EMT school, and has never looked back. Since joining Sunstar, Kasey has proven to be a great asset to our team. Since starting in EMS, Kasey has been both a Preceptor and Field Training Officer. Kasey is a Preceptor with St. Petersburg College’s EMS program, where she mentors and trains new students. In 2015, Kasey was promoted to Assistant Operations Supervisor. Kasey is very safety-conscious in every aspect of her job. Kasey strives to be her best daily and holds others around her to that same standard. Sunstar Paramedics is proud to nominate Paramedic Kasey Ras as a 2017 AAA Stars of Life recipient. She is a truly dedicated employee who loves what she does and lives by our CARE PLUS Values. Kasey always strives to do the right thing, no matter the situation. Kasey was honored with the CARE PLUS Award for an act of kindness that many others would never have recognized. After transporting a veteran to the local VA, Kasey noticed a man sitting on the ground outside of the ER. Kasey stopped and asked him if he needed help. The man replied that he wanted to go inside to get help for multiple issues, including housing, but he had his dog and didn’t know what to do. The man advised Kasey that he loved his dog and could not bear to lose him. After a few minutes talking to the man, Kasey called her wife and had her come pick up the dog in order for this man to go in and get the help he needed. Kasey and her wife took this dog in and cared for it as their own while the man worked with the VA to find permanent housing. After a few days, the veteran was placed in permanent housing and Kasey reunited him with his beloved dog. Kasey’s everyday commitment to her patients, partners, citizens of Pinellas County and Sunstar Paramedics makes her the ideal nominee. Sunstar Paramedics is very proud to have a leader like Kasey on our team.